In the world of wedding planning, you might feel pressure to produce on-trend events. Wedding planners must be able to work with current trends if their clients desire it. 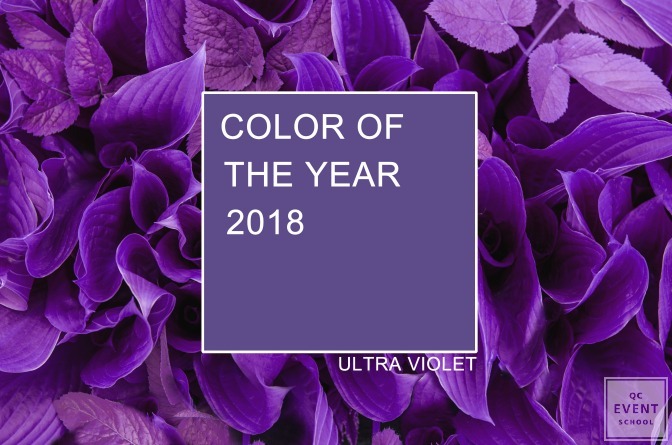 The trouble this year is that Pantone selected Ultraviolet as the color of the year. I mean, we love it, but it isn’t the easiest color to use in wedding décor. Ultraviolet is deep but vibrant. Only the most confident planners know how to work with it. Continue reading for insight on how to use ultraviolet accents during this year’s wedding season! Some colors look better with others. When dealing with a color as bold as ultraviolet, you must carefully consider the other colors in the palette. Aim to find colors that soften the look of ultraviolet. They don’t need to be light, but cohesiveness is key! One color palette that we love for weddings includes soft creams, gold, and ultraviolet. The colors blend together in a luxurious looking way without looking over-the-top. Blues, soft greens, greys, whites, and muted pinks also compliment Pantone’s color of the year. Speak with your clients about their desired color story. You should then prepare a variety of different palettes with the same or similar base color. Depending on their vision and personalities, one palette may suit them more than the others. One of the most obvious ways to add a pop of color is through flowers. 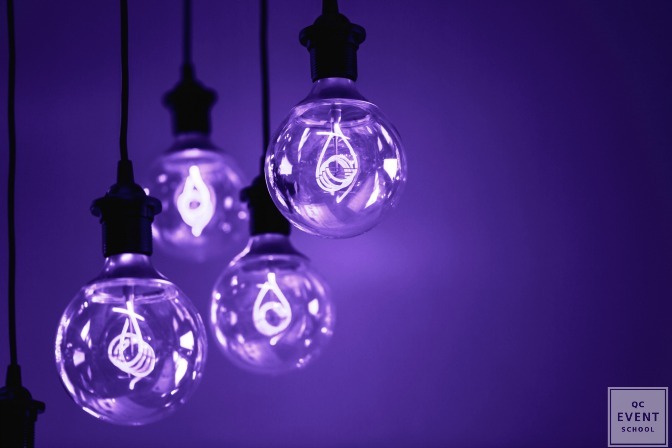 It’s crazy to think that a color as vibrant as ultraviolet is natural, but it is! It won’t be difficult to persuade brides-to-be to go this route. Some popular choices are lilacs and black forest lilies. Purple orchids and roses are also well-liked. 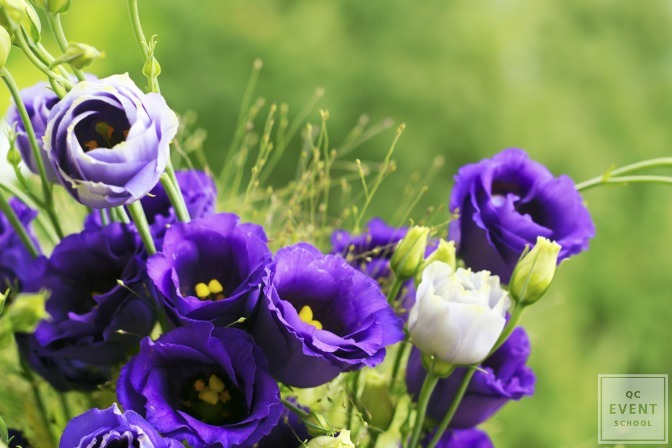 Whether you add these ultraviolet flowers to table centerpieces or bridal bouquets, you will be sure to make a trendy impact. If your clients are keen, they may consider a larger commitment. Lounge furniture is having a moment in the wedding industry right now. Renting ultraviolet accent chairs or a sofa would look upscale and on-trend. Since shades in the purple family aren’t typically found in furniture, you may need to do some digging to find exactly what your clients need. Accent cushions, curtains, and table textiles are also great options for ultraviolet lovers. The more plush, the better. Don’t be afraid of unique pieces! Encourage your clients to have faith in their vision. Working with color can be intimidating but with your experience in event décor, you are surely ready to take anything on. Nature doesn’t just produce purple flowers. Think of all the delicious treats you can make with ultraviolet inspiration. There are so many options available! A violet wedding cake is sure to make a statement. Not all couples will be comfortable with this idea, but for those who are, they have a beautiful on their hands. A popular way of injecting color into wedding cakes is through the use of fondant appliqués. Another popular motif that you can incorporate purples into is marble patterns. A white and violet marbled wedding cake is sure to suit the modern couple. The same ideas can be applied to cupcakes, macarons or whatever else is on the dessert table! Grapes, blueberries, figs, and blackberries are just a few foods you can use to accent your clients’ wedding decor. Whether it is to spruce up the catering or to add a natural touch to the decor– Mother Nature has you covered in the purple department! The deep and romantic hues will add variety to the collection of colors and enhance the authenticity of the accent color. Wedding planners know that it is all about the details. Even if your clients’ have more subtle taste in color, there are plenty of opportunities to add doses of violet throughout the decorating scheme. Lighting is a necessary part of every wedding. Many couples opt for soft white lighting or a rotation of colors. Try violet lighting instead! You can use it to accent the venue or specific areas the newlyweds would like to draw attention to. Lighting doesn’t need to be limited to colored light bulbs! Since ultraviolet is such a luxe color, a few key pieces can effortlessly elevate any space. Violet pillar candles are another gorgeous addition to venue decor. Beyond adding a splash of color, they will create warm lighting and a romantic ambiance. Ultraviolet is a jewel tone, so how could we not suggest a few more? Hello, amethyst and violet sapphires! You can also use tanzanite, iolite and rubellite gems! How gorgeous would these look in a chandelier? Or, how about attached to napkin rings? There are so many ways you can add a hint of sparkle and purple to wedding decor. If your clients are on the less glitzy side, consider using some big amethyst crystals to decorate. Thinly sliced pieces of amethyst also make beautiful coasters! The most important thing to remember when using Pantone’s ultraviolet is a balance. Don’t let one color overpower the day. Just because you are using purple in your palette doesn’t mean the entire venue needs to be purple! Proceed tastefully. It’s always possible to add more ultraviolet later! Make a point of checking in with your clients often. After all, they will be the ones holding the wedding photos near and dear for years to come! Whether you choose to suggest it or not, you will see many weddings this season feature ultraviolet. How will you use ultraviolet this season? Are you interested in decorating your own events? Check out our specialization Event Decor Course!